It’s not like I didn’t realize it would be a bad day. Ciara’s been cutting her eye teeth for what seems like ages now and has grown fond of 3am, two-hour-long hangouts on the couch. So yeah, when your three-year-old wakes up at 7am and you’ve just managed to get back to sleep you are definitely not starting your day on the right foot. So we had a slow morning. Luckily I batch-cook pancakes on the weekends so Maeve can have a quick breakfast if need be, but still, by the time I had her, myself and Ciara washed, dressed, breakfasted and out the door it was well past 9am. Maeve was fairly late for playschool. It had been a frosty night. After dropping Maeve off, Ciara and I went to town (town being Thurles, about 20 minutes away from the farm). On Tuesdays and Thursdays Ciara hangs out with my friend while I make donuts and other goodies to sell at The Green Sheep. On the way in, my car hit a patch of black ice and I was so close to losing control of my car and sliding off into a hedge. I honestly don’t know how I managed to keep the car on the road. Needless to say, I crawled the rest of the way into town. When I got to The Green Sheep, it was closed because my friend, the owner, thought I had a doctor’s appointment this morning and she had to go to a parent/teacher meeting. I had also thought I had a doctor’s appointment but thankfully called to double-check – it’s actually next week. Now, before you say anything: I know I should be paying for parking. BUT you get 15 minutes of free parking in Thurles, so I was taking advantage of that (ok, maybe too much advantage). So I got to my car before the ticket guy gave me a ticket. However; he remembered me from two weeks ago, when he had fined me for having out-of-date car tax. I had just gotten this car a few months ago and with Christmas… well… I knew I was playing with fire. I paid for my tax once he ticketed me, but it was still in the post. He didn’t give me another fine; instead he chewed my ear off. Combine this with exhaustion from being a parent and the hormones of a crazy pregnant lady and… well, you get the idea of how I’m feeling right now. I basically want to cry myself to sleep. And then sleep for a really, really long time. Instead, though, I might make some more of these Maple Pecan Cookie Bars. They’re so easy to put together and taste amazing. Baking is really therapeutic, isn’t it? You’re in control. Your hands are busy. Your mind is in a zen-like state. This is probably why I liked working in the pastry sections of restaurants so much, even though I’m not really a pastry chef. That section of the restaurant oozes calm while the others get chaotic. Anyway, back to these delicious, nutty little morsels. They have a brown sugar cookie base and a maple pecan topping that is soft, chewy and crunchy all at once. The maple flavour really comes through (and I was using the generic maple syrup – even though it claims to be “100% Canadian Pure”, it’s way too inexpensive to be any good). They were a hit at the café, so I’ll be officially adding them to The Siùcra Shack‘s menu and will put them on rotation at The Green Sheep. Give them a try; they’re so forgiving. Baking them will make you forget all about your crap day. Preheat your oven to 180∘C (350∘F). Line a rectangular baking tray with parchment and set aside. In a bowl, (or in your stand mixer; paddle attachment), cream the brown sugar and butter for the base. Then, add the flour and mix until fully incorporated. Press the cookie dough into the baking tray with your fingers. When the dough is evenly spread out, blind bake for about 15 minutes. Check it at 12 minutes; you don’t want it too dark. Take the baked cookie base out of the oven and cool slightly. In a bowl, mix all of the ingredients for the filling except the sea salt and pecans. Pour the filling over the top of the cookie base. Arrange the pecan halves over the top. Bake the bars, still at 180∘C/350∘F, for another 15 minutes or until it’s just set. If the top seems soft that’s ok. It will set as it cools. Allow the bars to cool completely in the pan. Then, remove the whole thing (parchment and all) and slice into bars or squares. This recipe comes from two different places. While backpacking through the Northern half of Portugal last March we had to make a decision between visiting Coimbra and Aveiro. Both are in the same general area (about 20 minutes apart), both are small & culturally rich university towns and both have their own unique appeal. 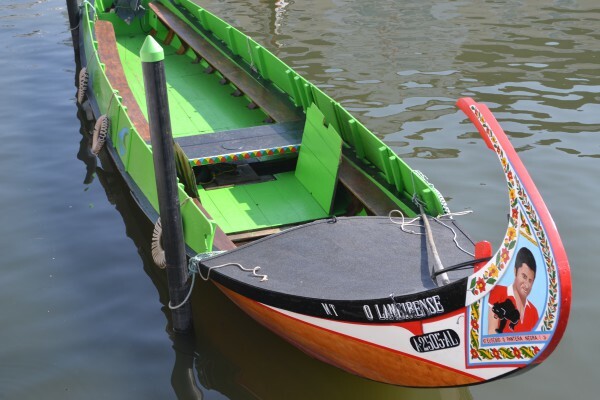 What made us decide on Aveiro (besides its proximity to several gorgeous beaches and a Venetian-like canal system snaking its way through the town) was its interesting culinary traditions. There have been salt flats there for hundreds of years and the salt is some of the finest I’ve tasted (especially sprinkled over blistered padron peppers – I’m salivating just thinking about it). They also specialize in a weird little pastry known as ovos moles. Made into the shape of seashells, the outer shell of the pastry is made from a manna-like wafer, similar to what you’d receive at mass for communion. Not much taste to it, and depending on where you buy, it can be a bit stale and chewy. I’m not making it sound very nice, am I?! Maybe I’ll do better with the filling. 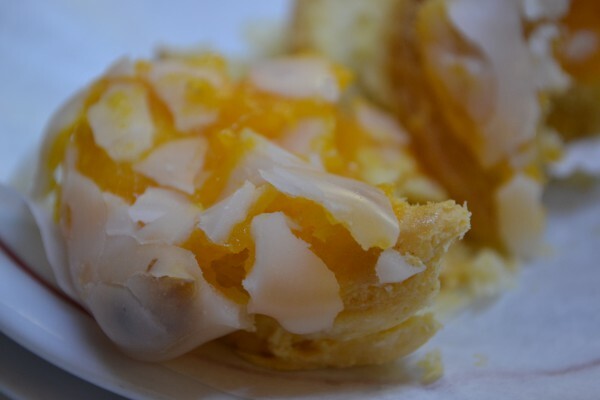 The filling is made from egg yolk, but not in the way you might expect. It’s not a custard. You make a simple syrup and mix it with rice flour before beating in the egg yolks. The end result is kind of like a sweet deviled egg. Strangely delicious. 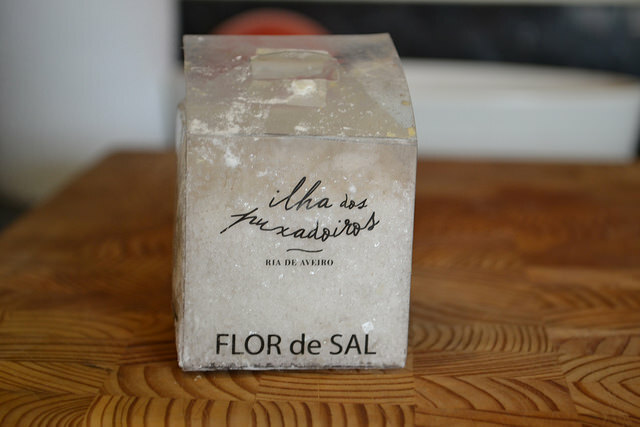 Before we left Aveiro I stocked up on flor de sal. Months later, I still have a cupboard-full (go me!). I save it for special occasions. It’s better as a garnish than a seasoning (though you can get big bags of rock salt, as well, to use in your grinder for every-day seasoning). We’re well into October now and the gorgeous weather we were enjoying here in Ireland has left. Now we’re having day after day of rain and high winds. 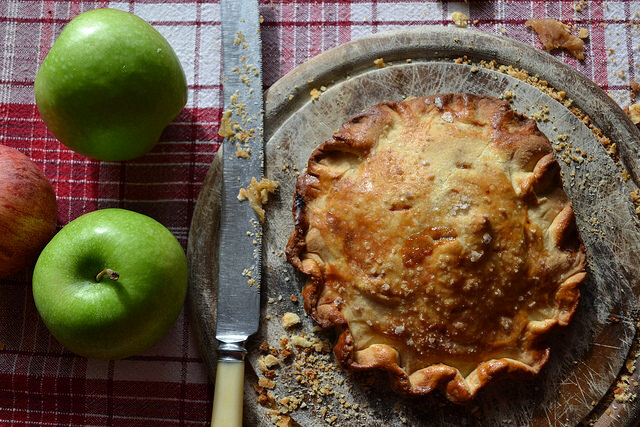 Aside from reminiscing about our lovely, sunshiney holiday in Portugal, it’s definitely a time for hearty desserts and, as we have such beautiful apples here in Ireland and so many right now, why not combine a sweet apple pastry with a luxuriant sprinkling of flor de sal? The combination is good for the soul. 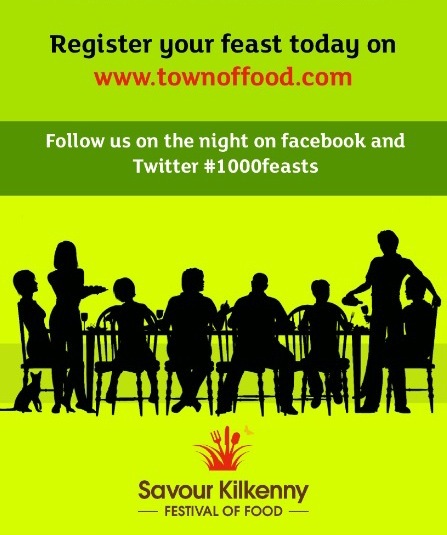 I’ll be in excellent company with some other fabulous Irish bloggers – Foodborn and Bred, Cork Billy, My Busy Farm Life, Greenside Up, The Art of Exploring and Where Wishes Come From, among others, so give them a follow as well to see what we’re up to. 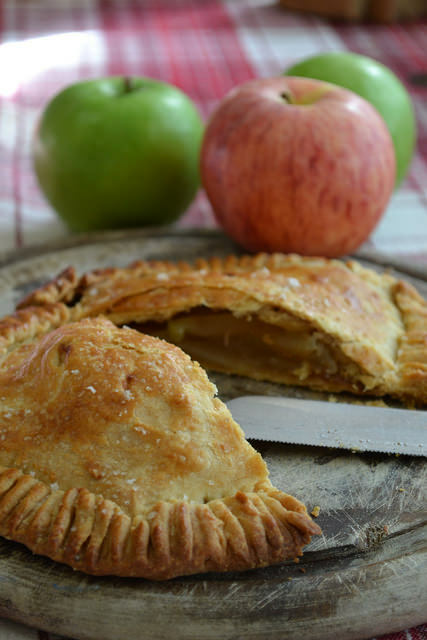 In the meantime, enjoy these sweet, salty and tart apple hand pies. They’ll make the bad weather seem not-so-bad. Make the pastry: cut or rub the cold, cubed butter into the flour & salt until the mixture is well-incorporated and looking crumbly. Gradually add the ice water and mix with your hand until a ball forms (you might not need the entire 1/2 cup of water). On a floured surface, knead the dough a few times just until everything comes together. Divide the dough into 8 equal portions and chill for 30 minutes. Make the toffee sauce: in a medium saucepan, add the sugar and water. Place over med-high heat and leave it. Don’t you dare stir it! When it starts to bubble, wait until the colour begins to change, then every now and then you can swirl the contents of the saucepan, but still, don’t stir. Seriously. When the caramel turns a deep copper colour (and starts to smell like a caramel), take it off the heat. Add the cream and immediately put it back on the heat. It will bubble up for a few seconds. Don’t be scared. Now you can stir. Stir until the caramel & cream are incorporated. Then beat in the cold butter piece by piece. Set the toffee sauce aside to cool. I should mention that you can actually just buy some toffee sauce and skip that last step. It’s easier, but cheating. When the dough is chilled and the toffee sauce has cooled, preheat your oven to 425 degrees (210 degrees Celsius). Mix the apples, toffee sauce, and Tbsp of flour together in a bowl. Beat the egg slightly in another bowl (for brushing). Roll out two portions of pastry at a time. Scoop two heaping Tbsp of apple filling onto one rolled out pastry. Brush the edges with egg and top with the other round. Crimp the edges, poke a few breather holes on top, egg wash the top and sprinkle on some sea salt. 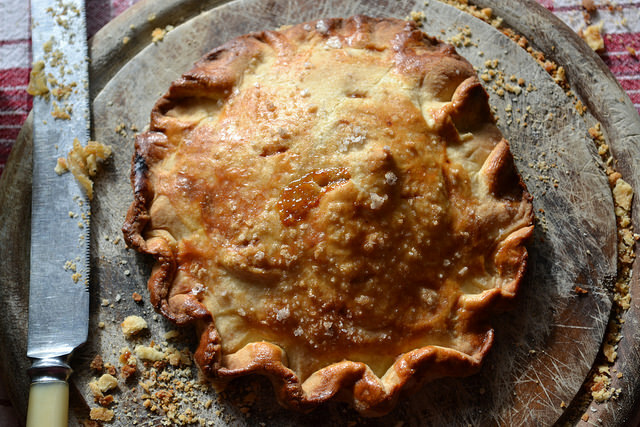 Continue until all the pastry has been used (this should make four hand pies). 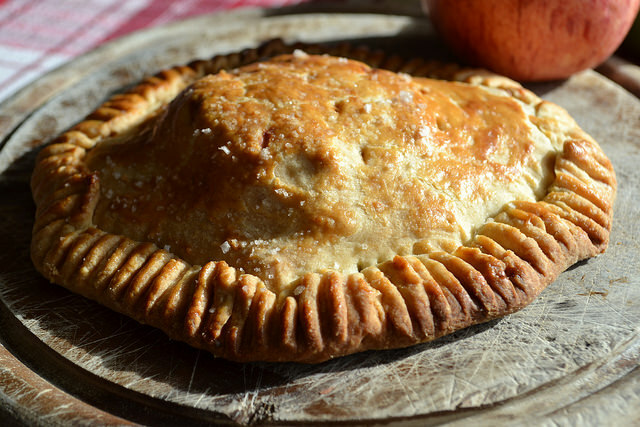 Bake the hand pies for around 30 minutes, or until the filling is bubbly and the tops are golden brown.